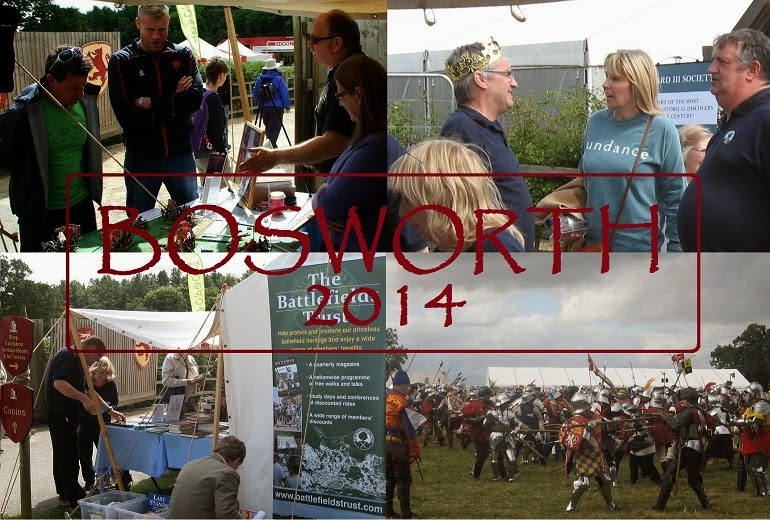 Over the weekend I helped out on the Battlefields Trust stand at the Bosworth Festival. This was a great opportunity for me to take my DBA V3 configured model soldier 'Bosworth' home, as it were (albeit that the battlefield is really some 2 miles from the centre on Ambion Hill). 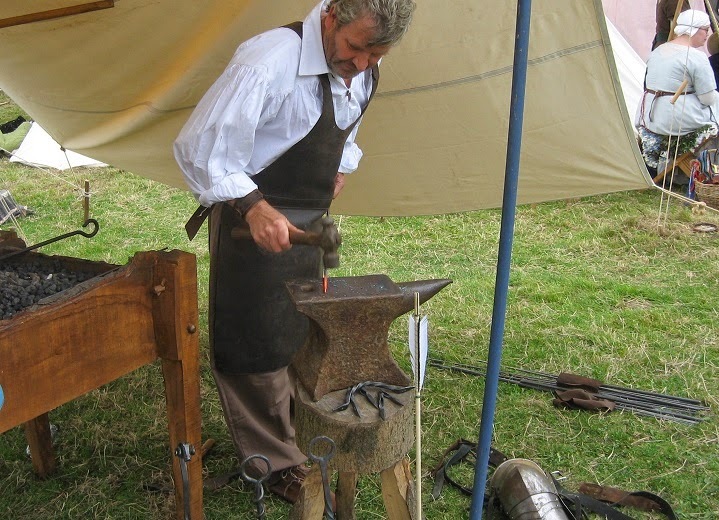 The event itself is one of the larger reenactment type heritage festivals, with Living History encampments, heritage market stalls and jousting and battle arenas. 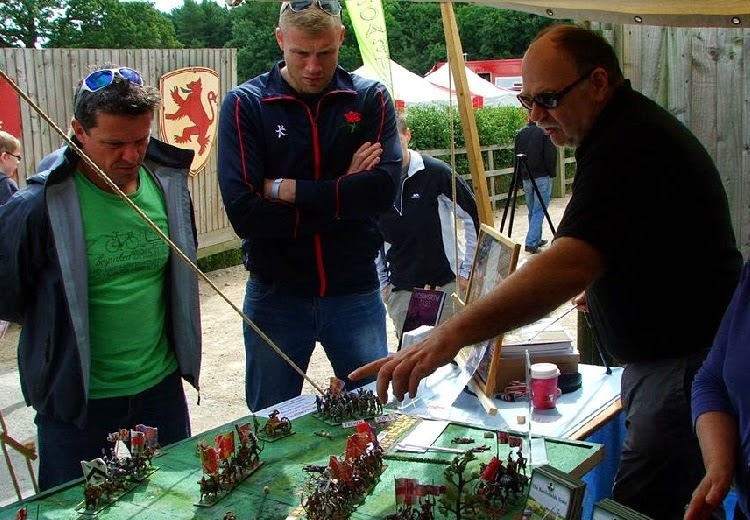 Many visitors, of course, are able to take advantage of the Centre's permanent exhibition, and some stop off at the battlefield itself, down on Fenn Lane. 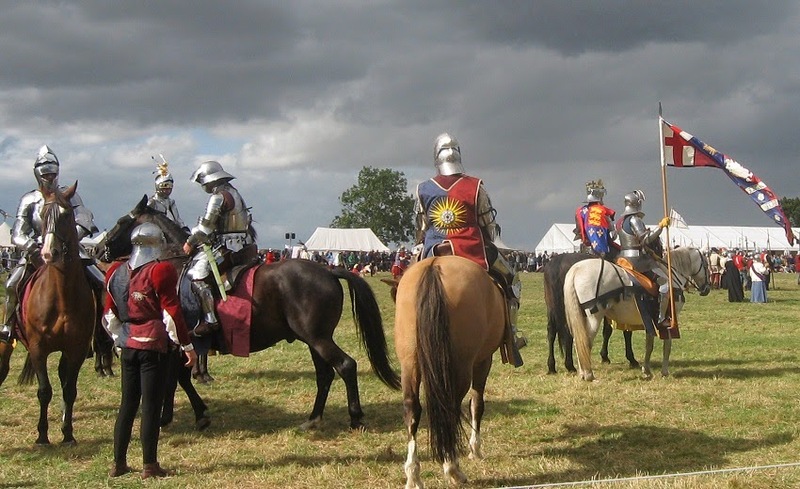 Each day's schedule finishes with the events of the battle recreated. 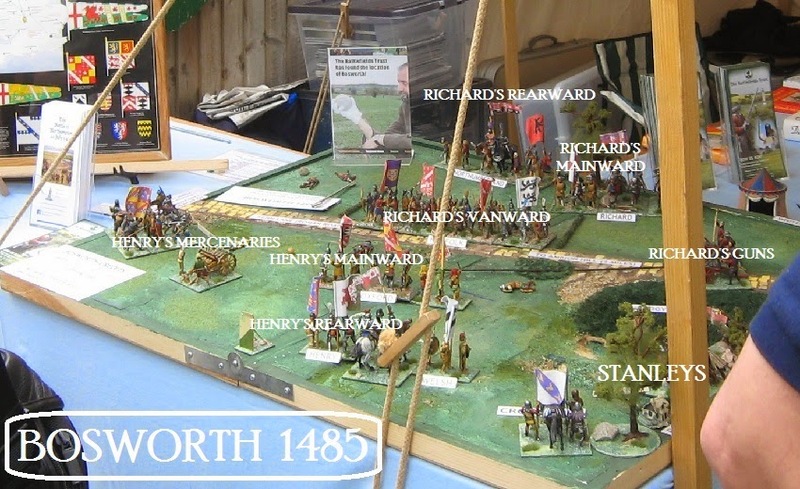 Inevitably I have come back with relatively few pictures of the reenacted battle - as I spent most of my time on the stand, explaining the miniature version of the battle to enthusiasts of all types and ages. 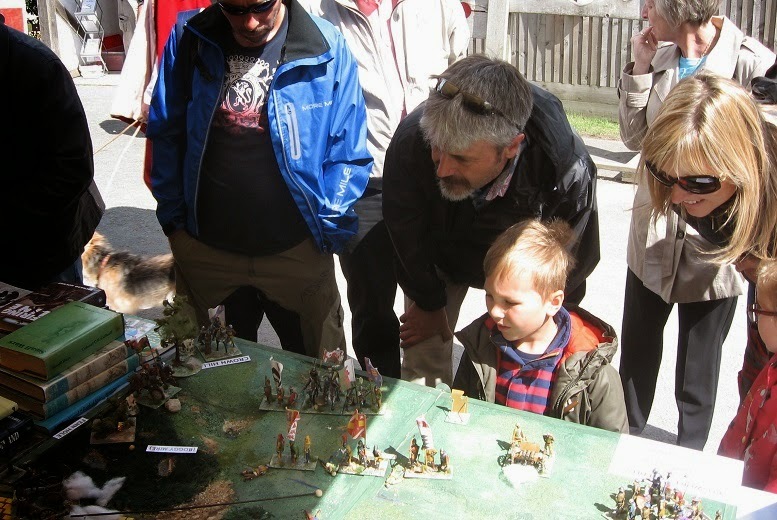 We had neither the space (nor the option, really) to invite people to play the game (as we would do at a wargames show), but got a very good response using the layout to explain what we think happened during the actual battle - and why the fragmentary contemporary accounts help us construct a plausible narrative. 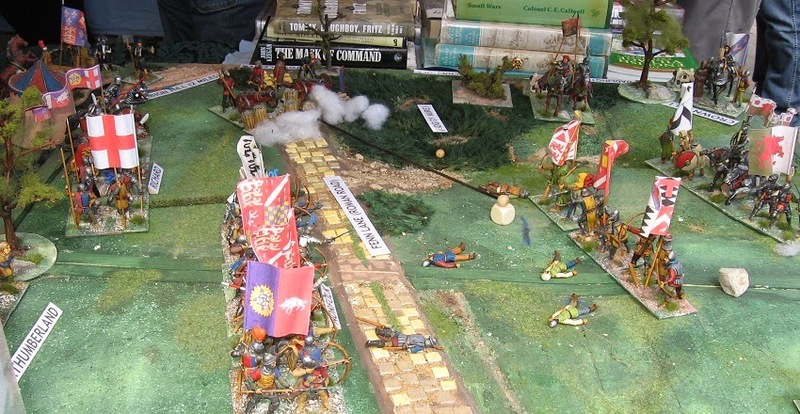 Many of them not from a wargame background, my associates in the Trust remain pleasantly surprised at the power of toy soldiers to attract attention to our projects and explain the conduct of events of the past. 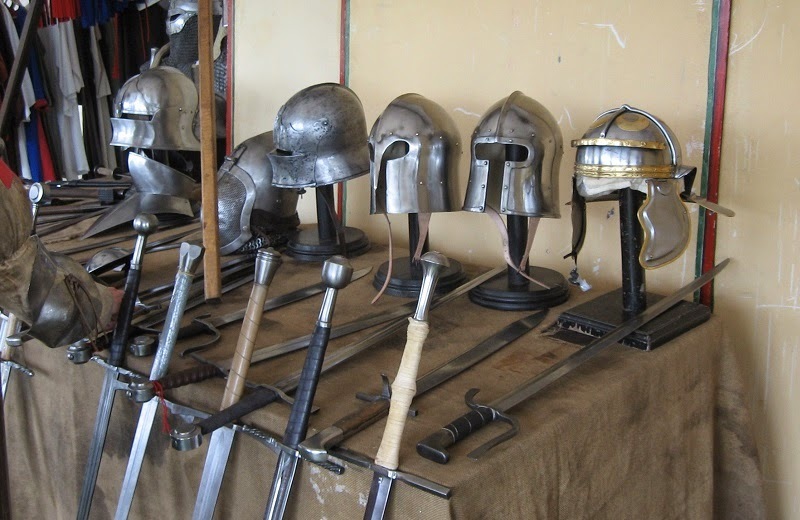 It helps people make sense of the new archaeological evidence and gives a context for the man-to-man bashing of weapons on armour that takes place in the main arena. The first thing to say is that there was no battle on Ambion Hill: the Battlefield Trust's long overdue archaeological project to find the battlefield proves this conclusively (so any of the reconstructions based on outdated locations are not just misleading or hypothetical, they are just plain wrong*) ... hills and rises play no part in the action. Although precise orientation is contentious, references to Henry's men attacking with the sun on their backs gives their advance a broadly South-to-North axis. 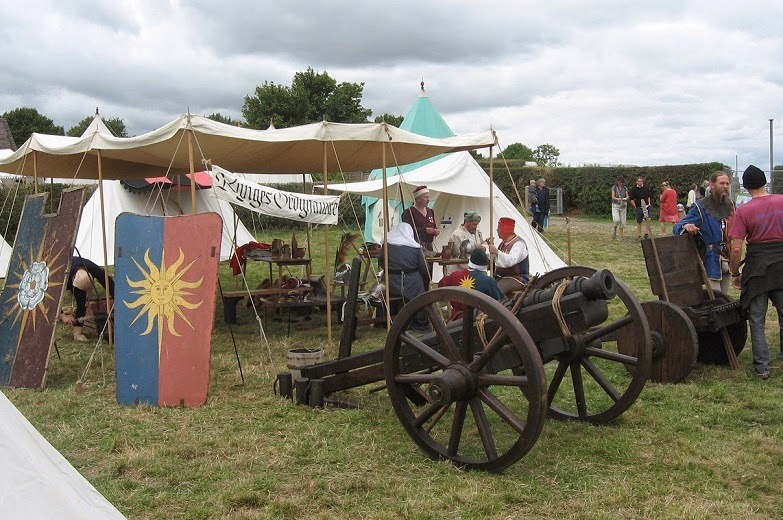 Historians, particularly those not familiar with the important role of artillery in late medieval battle, have traditionally been sceptical of the seven score Serpentines Richard took to the battle. However, the archaeology confirms extensive gunfire, and gives a shot dispersal along Fenn Lane that allows us to place Richard's guns batteried together (maybe even chained together) at the East end of the battlefield protected by the mire of Fenn hole and close to the roads. Molinet tells us that Henry's mercenaries ... densely formed pikemen, mostly ... deployed at the other end of the field to avoid the King's guns. Between these two end points, Richard's van under the Duke of Norfolk, arrayed like a rampart, opposed the Earl of Oxford's slender line. Behind these, we know Richard commanded the Yorkist Main Battle and that Henry commanded a reserve of household troops, loyalists and Welsh. 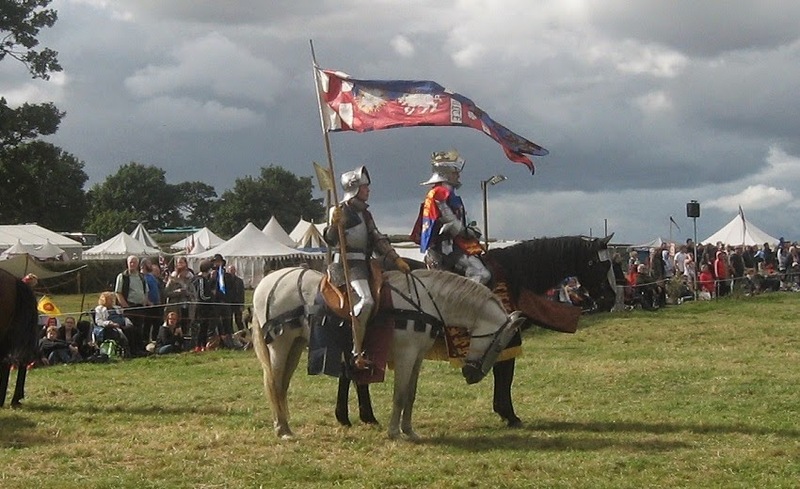 Absent from the Order of Battle was Henry's Vanward, Sir William Stanley ... certainly committed to the rebels but probably coerced out of the battle by his nephew, Lord Strange, being held hostage in Richard's camp. Ordered into line by both commanders on the morning of the battle, the Stanleys remain where they camped overnight, around Dadlington - on Henry's right flank. Absent on Richard's side - at the back on my model - Henry Percy, 4th Earl of Northumberland, commanded the Rearward. 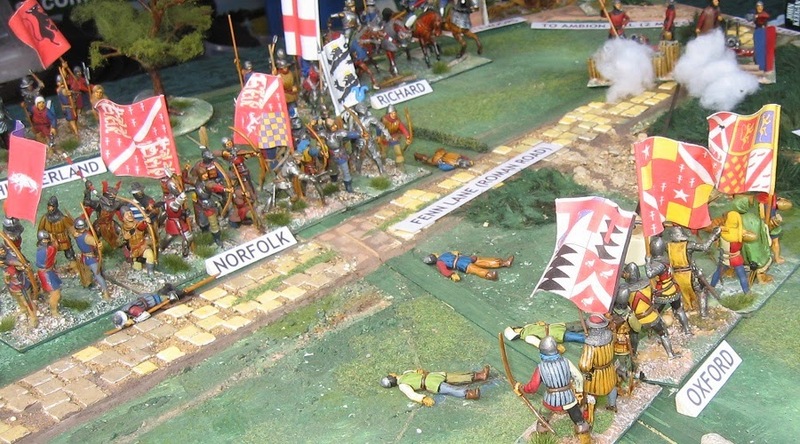 Northumberland's absence seems to leave Norfolk's flank hanging, and it down this end of the battle that Henry's lethal mercenaries began to engage. It may well have been because this fatally compromised his centre that Richard took events into his own hands. 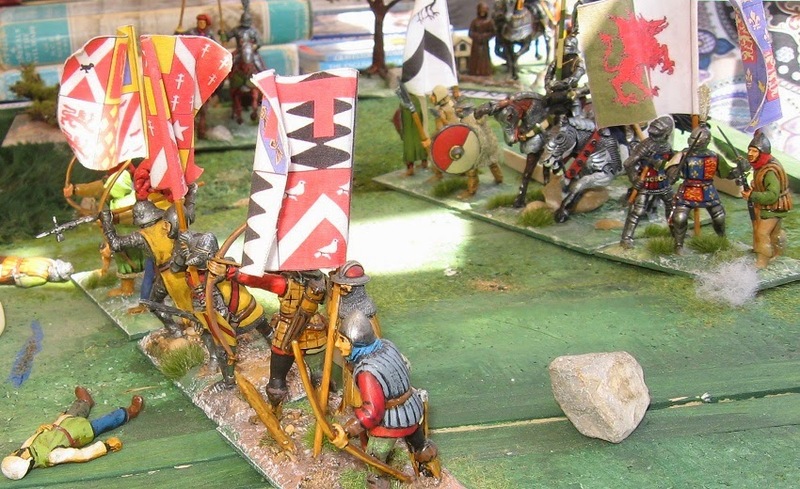 With Oxford strung out to oppose the larger body under the Duke of Norfolk, Richard took the opportunity to charge past main engagement ... between Oxford's flank and the mire at Fenn Hole ... and attempt to engage Henry in personal combat. This would certainly settle the issue. 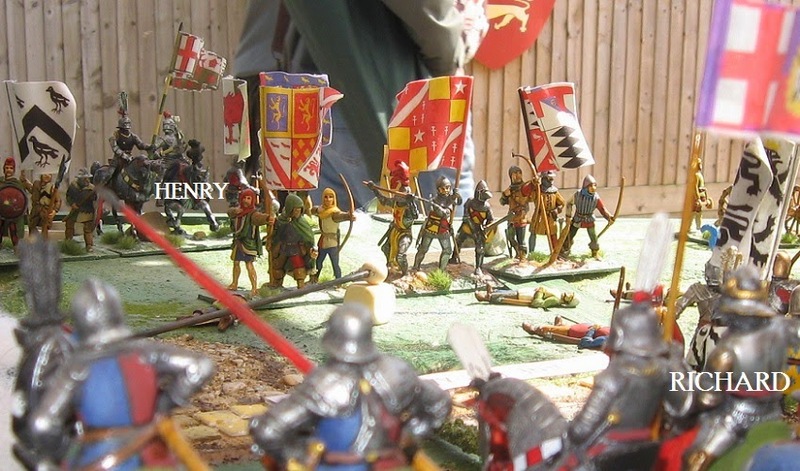 However, Henry seems to have had no appetite for the fight and it is his bodyguards and standard bearer who are cut down in Richard's attack. The attack does, however, expose the flanks of Richard's party to the Stanleys (still mustered around the villages on that side of the battlefield). Richard is engulfed, driven back into the mire and hacked down. Explored as a wargame, this narrative fits naturally to the new battlefield and simplifies the convolutions of the obsolete interpretation. Here is a quick set of pictures to give you some flavour of the event. All in all, a tiring but very rewarding two days in Leicestershire. 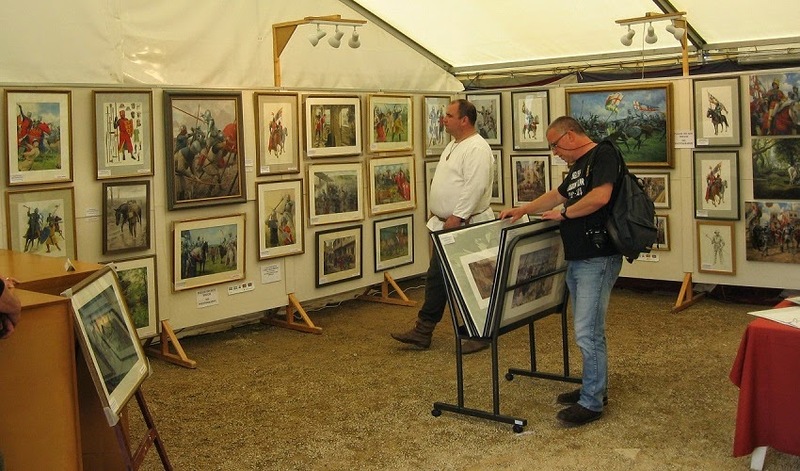 The battlefield display seem much appreciated and regularly gathered crowds. Inevitably, the biggest crowd was when England Cricket legend, Freddie Flintoff, stopped by with his camera crew. They were making a film about English summer events and took an interest in the battlefield display and the potted talks I was giving. We had a lengthy chat about the battle and the weapons of the day, much of it filmed for possible inclusion in a forthcoming TV show. Well, wouldn't that be good ... a wargame interpretation of one of our most important battles on a celebrity TV show. Well, stranger things have happened. And the offer is there, if they want to sit down and play the game. I hope something will come of it. Either way, it was great to meet a sporting hero. Great to be able to share my enthusiasm for the history with him - and it kind of gave us all a little boost to be the centre of attention for a few minutes. ** there may be self-interest, even treason, in this: after the battle, Percy was arrested and imprisoned, but after a few months was released ans allowed to keep his lands and titles. Failing to come to Richard's aid - deliberate or unavoidable - seems to have been to his long term advantage.